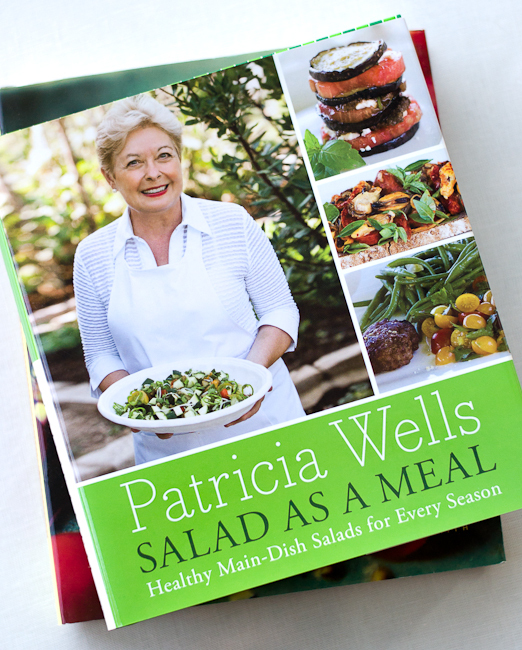 This week, just in time for the “dog days” of summer, I’m giving away a copy of Patricia Wells newest cookbook Salad as a Meal. This is perfect for how you’re cooking now for summer…light, healthy and tasty. My husband Jeff, daughter Dana and I worked on this cookbook and I know that you will enjoy the recipes and of course, anything written by the legendary Patricia Wells is a joy to read. In order to win, just share a favorite summer food moment in the “comment” section of this post. The winner will be picked at random by Dana next Wednesday at 7:00 p.m. CT. We will be picking the “old fashioned” way, I’ll print each comment, put them in a stock pot, stir and out comes a winner! Good luck and I’m looking forward to hearing from you! p.s. thanks for all your wonderful posts. am enjoying reading your blog very much! Ice cold watermelon! Tuna macaroni salad with crunchy french rolls! Iced tea with int! And homemade peach ice cream! When I think about summer food, I think about lobster — remembering the summer on Cape Cod when my Dad had lobster pots, and more lobster than one big family eat! My Favorite summer food is grilled chicken with homemade barbecue! Messy and delicious!